Lara’s PhD study examines evolving design practice and design education in the 21st Century. Since 2000 there has been a significant shift in design, with boundaries between disciplines dissolving and many designers appearing to defy classification. Whether trans-disciplinary or post-disciplinary, these emerging studios are altering the design landscape and yet uni-disciplinary pedagogy still dominates undergraduate education. The aim of the research study is to examine the processes of these contemporary UK design studios in an attempt to identify key characteristics and possible commonalities between them. Studios taking part in the study include Heatherwick Studio, Ron Arad Associates, Punchdrunk, Jason Bruges Studio and Assemble. The study will conclude by examining the implications of these emerging processes for design pedagogy and non-creative environments. Completion of the study is schedule for 2018. 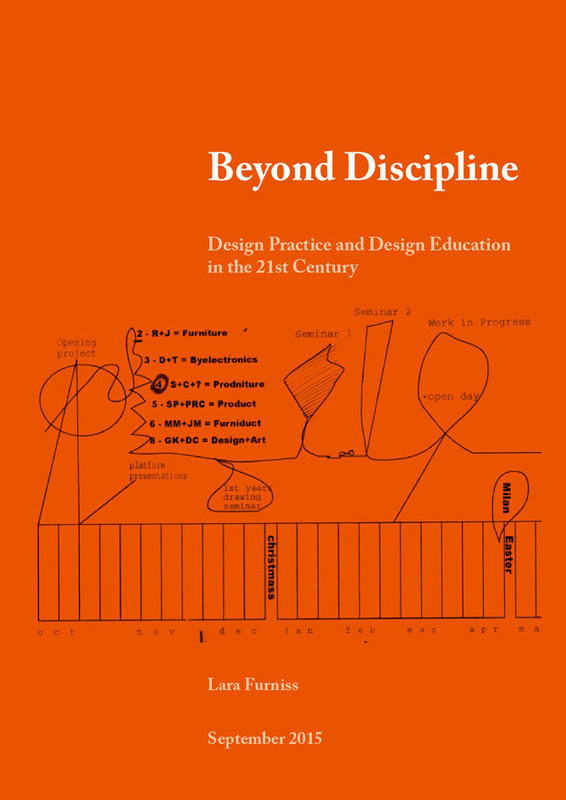 An initial report Beyond Discipline: Design Practice and Design Education in the 21st Century, published in 2015, examines dramatic changes taking place in UK design practice since 2000. It draws upon interviews with twelve leading design sector commentators to investigate key vectors in the evolution of the design sector. Commentators include Thomas Heatherwick, Ron Arad, consultant and former editor of Design Week Lynda Relph-Knight, Chief Executive Officer of D&AD Tim Lindsay and Chief Executive of Design Business Association Deborah Dawton. The report argues that many contemporary design studios now defy classification, and that design practice is characterised by the dissolution of traditional specialisms and disciplinary boundaries. It argues further that undergraduate design education largely fails to reflect this shift, and in retaining a uni-disciplinary structure is heading for potential crisis. The report concludes that swift and dramatic action is required to avert serious future damage to the UK’s design sector, and that such action will require creative collaboration between government and the design and education communities.